Jérémy Demester takes on the nature of art and the artifice of myth—old myths from the taming of fire, and new myths produced by television. His exhibition at Galerie Max Hetzler in Berlin borrowed its title, Fire Walk With Me, from David Lynch for a lateral exploration of the human condition with several work groups involved in a dialog: Undead still lifes, in which almost postimpressionist trees grow into luxurious landscapes; Sky paintings, where glorious color carries a symbolist meaning; War paintings, inspired by the headgear and facial markings of the American Indian; and, in the center, two totem-like sculptures, a bronze dog with its head sawed off and a BMX bike with the skull of a ram as a figurehead. The book presents all works in full detail and in exhibition shots illustrating the way in which the separate parts interacted in the space. The images are accompanied with an essay on the show’s mythical themes by the art critic and psychoanalyst Annabelle Gugnon. 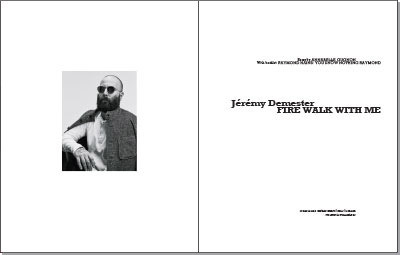 Additionally, the publication contains a booklet of a concurrent show Demester organized for the gallery: You know nothing Raymond, a homage to the late Raymond Hains. Here the young artist selects works by his older peer, the title in tribute to Hains’ never flagging curiosity, and the selection of works attesting to the visual, even painterly, qualities of his conceptual oeuvre. “The tumult of the world, spinning in the depths of the brain, ends up in one movement, perceived by each one of us, each with our own lyricism, our eyes, ears, mouth, nose… And art, I believe, puts us in that state of grace in which we understand universal emotion.” Cézanne’s words, spoken in his studio, reach down to Jérémy Demester’s contemporary painting. 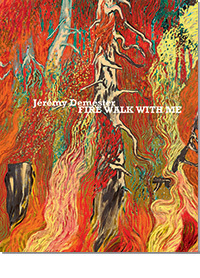 With the exhibition Fire Walk With Me, Demester catapults us into the savagery of the world. This wildness conquers our body. Our five senses cling to it, diffract it, try to tame it. The pigments, the forms, the movements of his canvases make visible the elements that stir the universe. They surface from the magma of color and the precision of poetry as if from a parallel world that bubbles in the very heart of our lives. This world does not disclose itself but secretly guides desires, produces dreams, holds the memory of humanity, of our childhood. “Thru the darkness of Future Past / the magician longs to see / One chants out / between two worlds / Fire walk with me.” These lines from David Lynch’s film are the starting point of a path that Jérémy Demester walked during a year of intense work. Fire was at once the danger and the armor. “Where there is danger, the rescue grows as well.” In purple avalanches and ashy eruptions, between bubbling sap and stirred-up blood, vision joins enigma in an ardent struggle. Jérémy Demester sees forms as flux, as pulsations, outside of fixed structures. We find here humankind’s first approach to fire. Four hundred thousand years ago, human beings tamed the sparks by rubbing two pieces of wood together. This is when civilization made its greatest leap forward. Humans knew that lightning could set fire to the forests: they were subject to fires and gods. Once humans had the power to summon flames at will, they could also prolong the day past the threshold of the night, extend summer beyond winter, forge tools, light up caverns and make art by painting the walls. The Chauvet Grotto is Jérémy Demester’s hinterland, a time of art outside history, of space reaching back to its origin.